Only about three weeks more to go before the end of the course and thought about it brings a sense of sadness within my heart. Somehow I find myself wishing that course was much longer and that people stay here together. Anyways the purpose of the course is not to have a bunch of saved Christians hanging around here but go out there and start fishing. 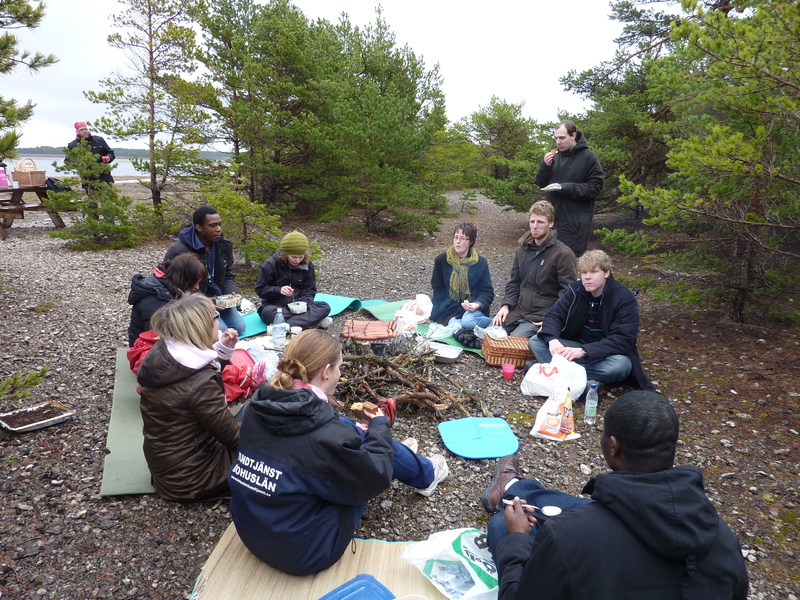 On the 5th of May we decide to get out of the classroom and just go out for a trip to the northern ends of Gotland on a small island called Fårö. Just the thought of leaving the serious and sometimes tense classroom and just be outside and interact with each other and enjoy the sunshine on the coast and have barbeque excited most of us and I really looked forward to having this trip. Knowing the swedish undependable weather I just hoped this would be a nice sunny day. The day started unbelievably rainy and I couldn’t believe my eyes when I woke up and opened the curtains, it was pouring on a day most weather forecasts predicted a 25% chance of rainfall. I immediately told Lanre that day was spoiled and that it was better to cancel the whole trip. We set off anyway in three cars and not so long afterwards as if the rain was not bad enough it started to snow. We went in the strength of God and dared the cold. 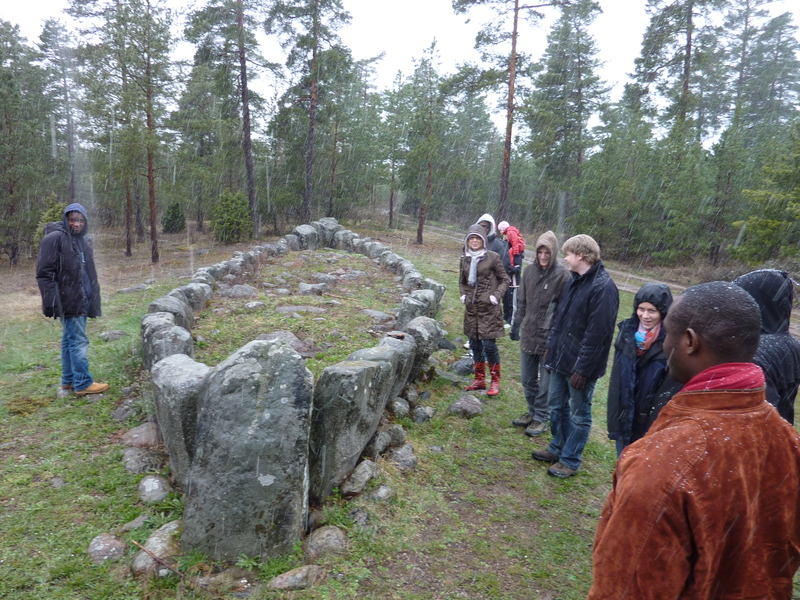 We made our first stop Just south of the town Slite, near the east coast of the Baltic island of Gotland where there is a stone circle (or rather stones set to outline the shape of a ship) called Tjelvars Grav. Now this is the guy thought to be the first man to settle on Gotland about 6000 years ago. It was interesting to hear the story about him and the evil Gotland before Tjelvar lit the fire and chased away the evil. From Tjelvars grav we drove to Slite and had Fika(coffee break) in Petra’s garage. We couldn’t find the key to inside but it was nice to sit outside. Afterwards we had a shot stop at the cement pit mine before heading off to Fåresund the most northern town on Gotland. To go to faro you need to get onto a ferry which carries you over the straits. Now something funny happened here, our turn came to get on the ferry and one of our beloved friends Jonas was nowhere to be seen. Only when the ferry was almost half way on the water then did we see Jonas left behind, it was kind of funny though I hope he does not miss the rapture too. Luckily the ferry goes every half an hour so the lost ship was brought back. On Fåre glimpses of sunshine brought hope to my discouraged heart. First we stopped at an old church and we got a chance to see the grave of Swedish filmmaker Ingmar Bergman who lived and died on Fårö. I found something on wikipedia which I thought would be great to know about this island. 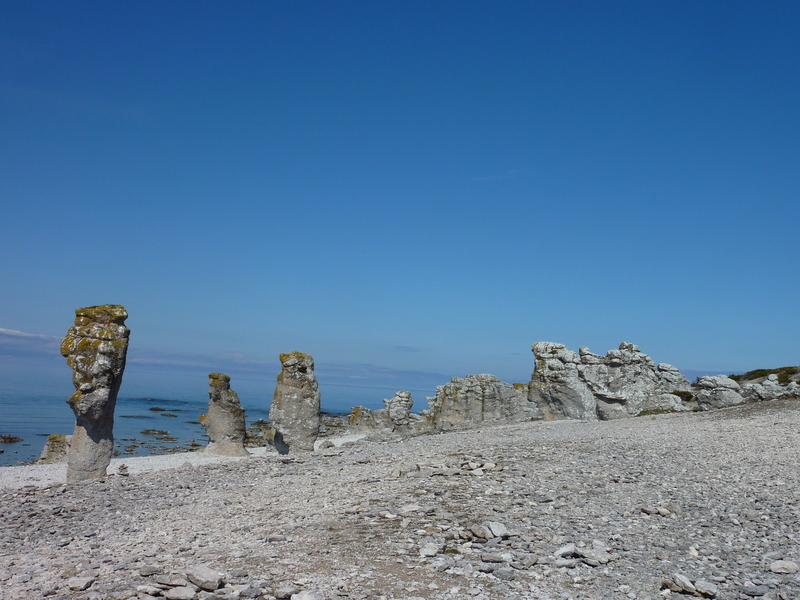 The name ”Fårö” (in Gutnish”Faroy”) is derived from the words ”ö”, meaning island, and ”far-”, which is a word associated with travel like in the Swedish word ”farled” (fairway). 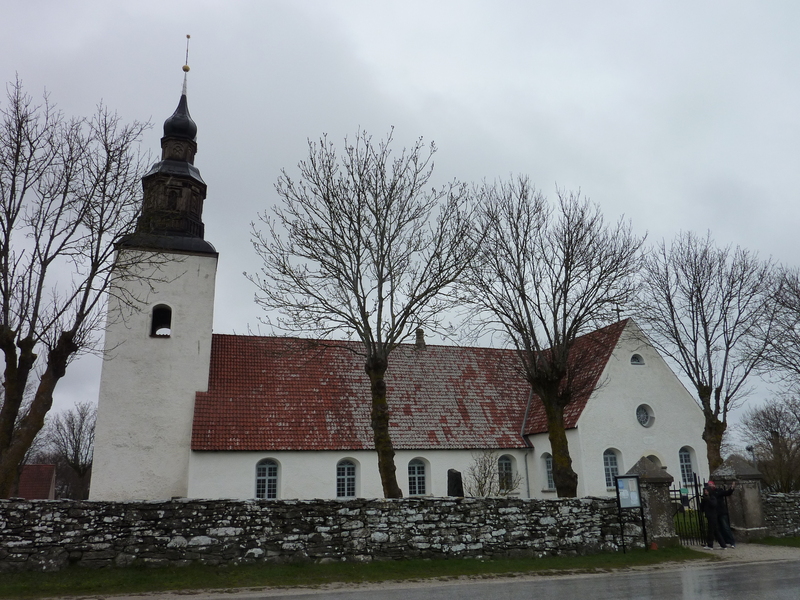 The word Fårö probably means the island you have to travel to or the traveler’s island. Mainland Swedes might misinterpret the name Fårö to be derived from får, the Swedish word for sheep, due to the many sheep on the island. However, the Gutnish word for sheep is ”lamb”. Just to make the long story short. We had a nice time on the island, sunshine came and we had sausages grilled and played some funny games from Gerd and ended up with a wonderful meal at Peter and Florence s beautiful home in Ekeby.